Proof that lightening strikes twice. I’m sharing. This is the second editor’s choice award my stories have earned this year. If you’re a writer and have short stories you’d like to showcase while building an audience, consider participating in the Fiction Writers Platform. It’s free, easy to join and it helps build that online presence agents and publishers say they’re looking for. The site gets about 20,000 visitors a month. More than 75 writers participate. Thanks for finding the time to check out the site, read “Waltzing with Birdie,” and commenting on the story. But, this past week has been slow in the fiction writing department for me, too much fun on the road, I guess. 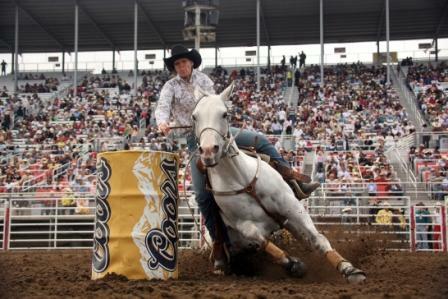 Ran down to the 100th California Rodeo in Salinas on Thursday. My friend Margaret’s father and brother, Old Jim and Jimmy Rodriquez, were among the first inductees to the California Rodeo Hall of Fame. A rodeo family with a long history in California, Old Jim ran a roping arena in Castroville and about every roper in the past 50 years has honed his skills there. Jimmy is a phenom — world champion roper and all-around cowboy, already in the national Rodeo Hall of Fame. Induction ceremony included a delicious lunch on the patio, light ocean breezes, and music by Monte Montana and Country legend Lynn Anderson (hit: “Big Girls Don’t Cry”) along with actor and rancher Wilford Brimley who gained fame by performing in movies such as; “The Hotel New Hampshire”, John Carpenter’s “The King”, “Cocoon”, and “The Firm.” Wilford also played a role in the 80’s drama series, “Our House” and “The Waltons”. He may be remembered best for his recent Quaker Oats and Liberty Medical commercials. 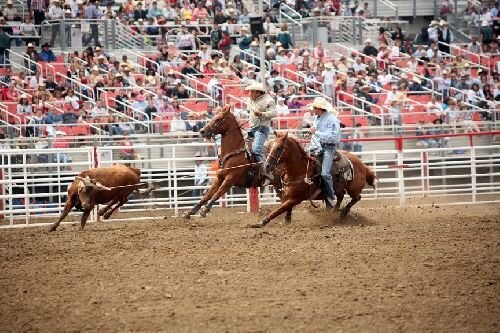 I come by my love of rodeo honestly. My father was a bronc rider in the 1950s, drove the famous Budweiser Clydesdale team, precision eight-in-hand, at the Grand National Rodeo at the San Francisco Cow Palace, taught me to ride before I could walk. Back then, our family had a small ranch in West Marin County, raised chickens, trained horses. My father hunted big cats and fished Lagunitas Creek for salmon. These days my niece, Tara, is carrying on the family tradition, a top rider with the Sacramento-area 4-H Equestrian Program. So, when I’m not rodeoing, I’m at horse and livestock shows. Today I’m off to the California State Fair’s sheep barn for the judging. My friend David’s, daughter is competing, having won the sheep competition in Ventura County. So now you know, I’m just a cowgirl at heart. I’ll get back to being a writer tomorrow. Yeehaw! I found out today from the Precious string cheese wrapper that sheep are part of the ovine family. I haven't verified that with google yet. Hi Nancy: Thanks for your comment. Just got back from the livestock judging at the State Fair. A friend's daughter was competing in the showmanship event — confident handling of all species–cattle, sheep, goats and pigs. She didn't win, but look great. Beautiful teens and beautiful animals. Answers.com says Ovine refers to sheep and sheeplike animals. It is based on Latin. Ovine can refer either to the animal, or to the act of being sheeplike. A group of sheep is called a mob, by the way! So, I learned something I didn't know. I thought a group of sheep was a flock, but no. They say it's called a MOB! Bye the way, there was quite a flock of people at the fair, temps topped out at about 102, meaning I sweat like a swine! Thanks again for commenting.